Laureen Tarpey is Contracts Manager and Executive Assistant for Kiernan Group Holdings, Inc. (KGH), a global consulting firm in the law enforcement, defense, and intelligence industries supporting federal and civil clients in the areas of strategy, policy, tactics, and training. Ms. Tarpey provides senior contract management expertise, executive assistance, business administration, and executes strategic contract and accounting support to KGH. Ms. Tarpey proactively works with the executive team on firm contracts, scheduling, client support, finance and accounts. 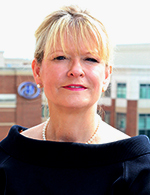 Ms. Tarpey has over 20 years of total professional contract management experience. As a Senior Contracts Manager for Science Applications International Corporation (SAIC) she provided management and administration of contracts and cost proposals with customers in U.S. Government such as Department of Energy, Department of State, Department of Justice, Department of Homeland Security, Department of Defense, and various other federal, state and local government and commercial customers. Ms. Tarpey independently reviewed and analyzed contract requirements to determine contractual obligations and provided continual review and administration to ensure that all terms and conditions are met, problems are identified and resolved in an effective and timely manner. Ms. Tarpey attended Marymount University and has a Bachelor of Business Administration.